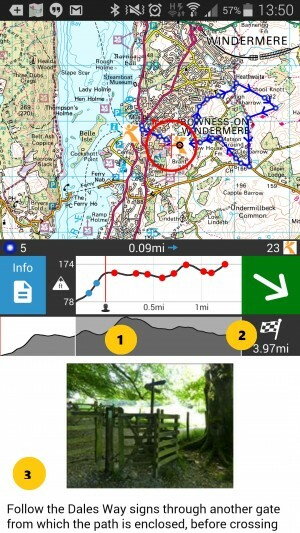 When following a route on Android, you will now have access to a lot more useful information on the map screen in the form of the new navigation bar. 1 - Navigation arrow moved to bottom right. When the arrow is on a is green background it means that it is functioning correctly. (If the arrow appears on a yellow background and shows a small yellow warning triangle this means that either the phone's compass is not calibrated (this can be fixed waving your phone in a figure of 8 with your hand!) or the phone has no GPS connection). 2 - Elevation graph – The elevation graph in the minimised bar shows the elevation of the terrain coming up in the next 2 km and any waypoints with information on along the way. The distance from you to the next waypoint is show just above the graph (point 4). (Please note that altitude data is only available for premium maps such as Ordnance Survey maps, so the graph will show a straight line if used with Open Maps). 3 – If you see an Info symbol in this corner, you can tap on it, or swipe up, to read the information about the waypoint you are at or have just passed (or listen to audio, if it's an audio symbol). 5 – When you start following a route, the map will be locked to the route. You can zoom in and out, but not move away from the route. To 'liberate' the map simply tap on the padlock icon. 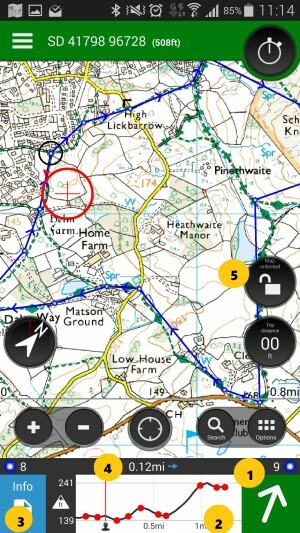 3 – any information available about the waypoint you are at or have just passed. Show me routes to download and navigate!